Typically, I pride myself on being fairly realistic about things. 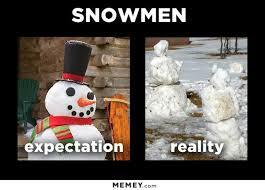 My expectations are generally on par with what actually happens. But, sometimes, my expectations turn into one big fat fail. Christmas is a tricksy little holiday. The images we conjure are of carolers and perfect cookies and beautifully wrapped presents under a symmetrical green tree. These images LIE. Expectation: I will start and finish my shopping early. Everyone will have carefully selected gifts that show how much I care while falling into my budget perfectly. Reality: I start my Christmas shopping on December 18th and do it almost entirely on Amazon. Free 2-day shipping with Amazon Prime? Yes, please! As of December 26th, there are still four relatives for whom I have not yet bought or sent presents. 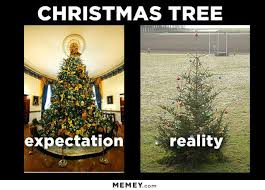 Expectation: We will decorate the tree as a family while listening to Christmas music and laughing. The day after Thanksgiving. My house will be a sparkling haven of festive beauty. Reality: My husband still hasn’t gotten out the Christmas storage boxes as of the 20th, so I do it. There are black widow spiders in our storage shed. I spend two hours kicking boxes in the yard, dumping their contents out on the grass, and kicking them again. It looks like Santa threw up in our front yard, but the decorations will be spider-free. I bring in the goodies, take an hour to set up the tree (by myself), and realize my husband threw away a bunch of Christmas stuff when he “cleaned out” the garage this fall. I have no ornaments, no tree skirt, no stockings. I have a tree and three boxes of white Christmas lights. That’s it. I go to Wal-Mart and buy cheap crap for this Christmas. I decorate the tree with my four year old. The Transformer’s movie (not Christmas music) is blaring behind us, and the rest of the family ignore us completely. Expectation: I will make the whole shebang. Turkey, dressing, gravy, mashed potatoes, sweet potato casserole, green bean casserole, rolls, sauce, etc. All from scratch. It will be delicious and we will eat the leftovers for days. Reality: I make turkey, gravy, mashed potatoes, and green beans. I have way too much crap to do to spend 9 hours in the kitchen on Christmas Eve. The kids eat leftovers once, then ask for cereal or McDonald’s for dinner the next four days. Expectation: We will eat dinner then clean up the dishes so my kitchen is sparkling for tomorrow morning. I’ll make hot chocolate for all of us to drink while we hang our stockings. Then we’ll watch A Christmas Story on TV before the kids go to bed. After that, I’ll wrap up their presents and set them carefully under the tree. My husband and I will go to bed smiling with joy. Reality: We don’t do the dishes because the turkey puts us into a turkey-coma. 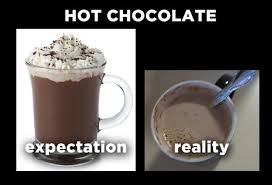 I don’t even want to think about drinking hot chocolate, let alone making it. Transformers (not A Christmas Story) is still blaring on the TV because that’s the only thing the four year old wants to watch. When I mention hanging stockings, my husband whispers “Let’s just leave them on the coffee table. The kids won’t care.” We don’t hang stockings. It takes me hours to wrap all the damned gifts. When I finally get done, my husband is passed out on the couch, it’s 2 a.m. and I’ll have to get up in like four hours. Expectation: The children will wake up excited for Santa’s arrival. We’ll open presents as a family. The kids will take all of their toys upstairs to play, and my husband and I will snuggle on the couch with our cups of coffee. Of course I’m a Charley Brown Christmas kinda guy! Lol wouldn’t it be nice if everything went according to plan? Or, when it doesn’t, the results were cute and funny instead of a facepalm? I think this is why Christmas can be such a depressing time for some people. High expectations and mundane reality. So true. I try to keep a sense of humor about the whole thing. If I can’t find a way to laugh in the midst of the chaos, I might drown in it!